Started off her year at the Cowboy Preview (Sept. 1), finishing fourth overall and second for the Razorbacks at 10:42.70… In her second meet, she finished fifth overall at the UC Riverside Invitational (Sept. 16) at 17:37.10, the fourth-best time for Arkansas. Began her career as a Razorback at the Riverside Invitational (Sept. 17). 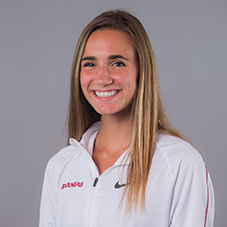 She finished with a time of 18:27.10 over the 5K course, good enough for the sixth-best time for Arkansas and 28th overall … Improving her performance with a personal best of 17:39.50, she was able to finish as 33rd overall and 13th for the Razorbacks. Redshirted her first year on campus. Named two years to the All Arkansas Preps Track and Field Team … Won Arkansas Meet of Champs 3200 meters and 1600 meters … One of only three female Arkansas high school athletes to ever break five minutes in the mile … Two State T/F Titles: 1600 meters and 3200 meters … Helped Cabot Panthers to win a second place state title in track and field … Best cross country time: 18:51 at 2013 Footlocker South Regional … Three-time 7A Central Conference Cross County Champ … Holds school records in the 1600 meters and the 4X800-meter relay … Arkansas All-State Track and Field …. Arkansas All-Star Cross Country Team … Finished sixth at 2015 Texas Relays 1600m with 4.59.99 … Fastest Mile (St. Louis Festival of Miles): 4.59.86. Born on June 28, 1996 … Daughter of Holly and Sandy Huckabee … Has an older sister, Marley and an older brother, Lance … Majoring in kinesiology … Plans on pursuing a career in physical therapy and or coaching upon completing her degree.